Unless your business operates on a strictly cash up front basis, it’s inevitable that you will one day encounter clients who are reluctant to pay their bills. This is one of the most challenging problems that any business owner faces. If a bill has not been paid by a customer within the time agreed, it is usually best to wait a little and see whether the payment turns up. Approaching a client about non-payment, especially undiplomatically, can run the risk of impairing the relationship and therefore jeopardising the chance of future orders. This is something you should bear in mind if the payment does not turn up and you are forced to make your first approach to your customer about the issue. Tone is critical. Remain polite. Do not assume that you are about to enter into a confrontation. Always bear in mind that failing to make the payment may just have been a slip of mind and that your client may promptly rectify it when asked. If, after approaching the customer, the bill is still not paid, however, you will then need go through a graduated escalation in which your tone, while remaining formal and polite, becomes ever more sharp and threatening. It may be useful for you to prepare standard template letters (or emails) which you can use or adapt every time the non-payment situation occurs. Payment of a debt is normally considered “late” after 30 days have elapsed, although contractual terms or custom and practice in specific industries can change this. 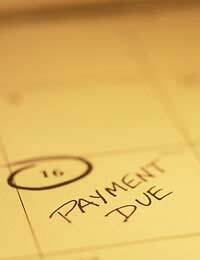 By law you are entitled to charge interest on late payments by other businesses. The interest rate applicable, unless otherwise specified in a contract, is the Bank of England base rate + 8%. If you choose to apply interest to your late paying customers, there are online calculators available which can help you work out the correct amount. Apart from interest on the debt, you are also entitled to levy fixed-rate charges on late-paying businesses to help defray the costs of recovering the debt. The amounts you can charge vary depending on the size of the debt and will be uprated from time to time to keep up with inflation, so check with the government to find out the latest figures. You will need to think carefully about how aggressive you want to be in applying debt recovery and interest rate charges to your customers. If you are too aggressive, you may sacrifice important business relationships. However, even if you decide not to charge interest on the money you are owed, stating that you will do so in your terms and conditions can often have a useful deterrent effect. If letters and phone calls ultimately avail you nothing, you will have to consider further action. At this point, you will have to make a judgement about whether or not your customer has the means to pay you at all. There is no point in embarking on expensive legal action if your client is bankrupt and has no way of paying you. In some cases, you may just have to write the debt off. If you decide to take legal action, where and how you do it depends on the amount you are owed. You can pursue small amounts through the Small Claims Court on your own; otherwise you will usually need a lawyer. Alternatively, you can outsource the debt recovery process to a specialist firm. A debt recovery company will attempt to obtain payment on the money you are owed in return, of course, for a fee, usually around 10% of any amount recovered. Some debt recovery firms are adjuncts of established legal practices; others are independent but will have regular legal partners to turn to if legal action is ultimately required. What does a debt recovery firm do? Initially, a debt recovery firm will do exactly what you have probably done : send letters or make phone calls to the recalcitrant client. Although you might wonder why the same tactic is expected to produce a different result, experience shows that contact with a debt recovery firm usually does prove far more intimidating to a non-paying client than contact with you may have done. It instantly becomes clear to them that the situation has escalated gravely and that they are now only one step away from legal action. If the debtor still proves unresponsive, lawyers will then pursue the claim in court. Dealing with non-payment is, unfortunately, part of the burden of being in business. How you handle the challenge may ultimately decide whether your own business succeeds or fails.